(Scottish Episcopal Church)Worship at St. John's Episcopal Church, Aberdeen, Scotland. Christians are praying side by side with Muslims under the same roof for the first time in Scottish and U.K. history. 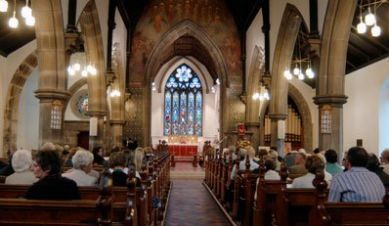 St. John's Episcopal Church in the north eastern city of Aberdeen has become the first Scottish place of Christian worship to share room with Muslims who worship five times a day. Prayers by the Muslim community in the city whose economy is driven by oil and natural gas were so popular that worshipers had been forced to pray on a cold, windy street. The rector of St. John's church, Rev. Isaac Poobalan, offered to open a specific part of the chapel after passing the nearby mosque one day. "I found 20 or 30 people outside on the ground around the pavements with hands and feet exposed," said Poobolan. "You could see their breath." Since opening St. John's church, more than 100 Muslims come to pray in the main chapel multiple times each day. Chief Imam Megharbi, who has once led prayers for his community in the rain due to the limited space at his mosque, sees the special arrangement as something that could be easily duplicated throughout the U.K.
"The relationship is friendly and respectful," said Megharbi. The chief imam and Rector Poobalan have worked together before, holding a joint service on September 11, 2011 where they read together scriptures from the Bible and the Qur'an. The Bishop of Aberdeen and Orkney, the Rev. Robert Gillies, sees St. John's as a model for inner-faith relations around the world. "Internationally, the news speaks of tension and struggles between Islam and Christianity," said Bishop Gillies on the church website. "Yet, here in Aberdeen, a mosque and a church have built bonds of affection and friendship." The church is a member of the Scottish Episcopal Church and belongs to the Anglican Communion. "It must be stressed that neither has surrendered or compromised any aspect of the historic faith to which each holds. But mutual hospitality and goodwill exists. Cooperation is there a-plenty. Laughter can be heard as humour links people together," said Gillies.